It is difficult for me to fathom now, looking back, that I considered abandoning this novel many times during its first quarter. 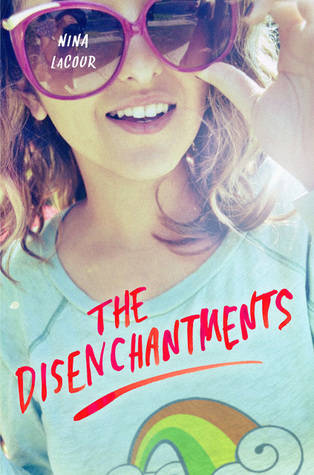 The Disenchantments starts out as a dull book, which hardly seems possible as it begins with a group of friends setting on a road trip to make music, but dull it certainly is. And then, suddenly, everything begins to pick up and from that point on, it hits you – or it hit me, at any rate – like a ton of bricks that this book; this book is so, so good and it’s only going to get better. I don’t get that feeling a lot when I’m immersed in a novel, but when I do get it? I perk up, listen, and stick with the novel. And I am incredibly glad I did. Nina LaCour’s sophomore novel is nothing like her debut, Hold Still, which reeks of depression and sadness amidst its beauty. The Disenchantments is about nothing as serious as death, but it is just as valuable and important. Colby and Bev have been friends since childhood, always intent on skipping college and flying straight to Europe after high school. Thus, when Bev announces that she did, in fact, apply to college and get in, Colby is stunned. Unlike Bev, his future has no direction. No concrete plans. And he suddenly is stuck with two tickets to Europe and a whole bunch of uncertainty. If there’s anything I love, it’s a book about self-growth. The Disenchantments is a wacky sort of novel, flying everywhere and nowhere at once, but everything comes together by the end. Colby and Bev go on separate journeys; he realizing what life will be like without Bev constantly by his side and her realizing what life will be like now that she’s made such a huge decision. For Colby, the possibilities are now endless and that, more than anything else, scares him. He could go to Europe. He could go to college. He could do anything. LaCour captures the helplessness that teens feel when finally thrust upon the vast world so perfectly and though Colby and Bev aren’t your average teens and their story isn’t the typical one, it still resonates. Its message is hopeful and meaningful, the journey Colby takes is one of great importance and by the end, you cannot help but feel as if you can tackle the world. The Disenchantments is not a perfect novel, but it spoke to me, and at the end of the day, I really can’t ask for much more. 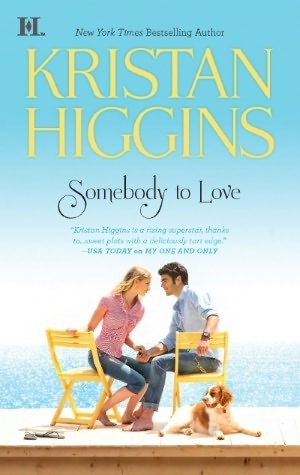 Somebody to Love veers away from the typical Kristan Higgins path - which is both a good and a bad thing. On one hand, it's refreshing to have a protagonist who is a single mom by choice, not by circumstance; who isn't actively pining and seeking her Mr. Right; whose is perfectly happy with her life the way it is. And yet, Parker, the heroine of our tale, is rich. Very rich. In fact, she writes best-selling stories for children and gives all the proceeds to charity because she doesn't need the money. As such, when her father loses all of his - and therefore her and her son's - money, she is forced to spend the summer in Gideon Cove fixing up the shack her aunt left for her and hopefully selling it so she and her son can find a place to live. Into this mix enter James. Or Thing One. James is Parker's father's lawyer, Harry, and as he listens to his boss, Parker is unable to see him as much more than a minion of the father who has never had any time for her. James and Parker have a past, though, one that finds the time to catch up with them when James is sent to help Parker settle into Gideon Cove. Needless to say, with a hot summer, cool water, and past memories, the sparks are sure to fly. Quite simply, my issue with Somebody to Love is the fact that Kristan Higgins wrote this on a beach with many half-naked men who had great abs. While Parker and James are well-developed, interesting, and mature characters on their own, their romantic development consists of ogling. Which is all fine and dandy the first or even the second time, but after a while even I got tired of reading about the fine and sweaty abs this lawyer had. (Why does he have abs? He's a LAWYER. Is he benching his law books or something?) While Higgins makes you realize why this couple will work for each other, there's a lot of filler tension and drama that does little or nothing for the plot. Also, James is not the most stunning of heroes. Okay, backtrack, I don't mean his abs aren't stunning, because I'm sure they are, but compared to the past Higgins heroes, he simply isn't as memorable. Yeah, he's sweet and him and Parker have that one-night-stand-in-the-past thing going on, not to mention the whole you're-the-bosses-daughter/father's-employer situation, but it all reads a little too bland. Cliche. Boring. I've come to expect vivacious and different characters from Higgins but Parker and James are characters you can find in any romance. Nevertheless, this was still a solid and engaging read. There are plenty of wonderful moments, forged friendships, and there's nothing quite like Gideon Cove. Also, Malone comes back to steal the show - so much so that you're wondering to yourself, "James who? Abs what?" I loved seeing him, Maggie, and the rest of the Gideon Cove gang back once again. Additionally, Higgins's trademark humor is still present and the inclusion of Parker's son, Nicky, was adorable and the moments with him were heartfelt. Higgins captured the mother-son bond in this perfectly, both the actual affection and also the complications of being a single mother and dating someone new. All in all, Somebody to Love is a quick summer romance, perfect for the weather these days and sure to delight. Just don't expect the same caliber of the first Gideon Cove novel going in. It's a shame that I DNFed The Disenchantments for the exact reason you described-- I wasn't hooked in the beginning at all! I was bored to death even when the characters were getting ready for the road trip. I should have stuck through though because the rest of the story sounds amazing! The message that Lacour gives is one that I want to experience. Perhaps I'll pick this one up again-- and soon! I haven't read anything by Kristan, but her books look so cute, fun, and fluffy! LOL at the lawyer with abs! Although the romance does not seem very steady at all, it still looks like a great summer/beach read. I do sometimes like fluffy books, so I might like Somebody to Love a bit better. Plus... puppy! LOL Might also enjoy the Disenchantments. I am an ending girl, so as long as I get to the end, I should be satisfied. Great reviews. As a RL single mom by choice, I think I'd connect with Somebody to Love very easily. I really am intrigued to see how the whole subject was handled. I've heard a lot of great things about THE DISENCHANTMENTS and I'm so glad that sticking with it paid off for you. I like that the story isn't typical and I'm interested in Colby and Bev and their stories. Also, glad that the Kristan Higgins worked well for you over all. It's so fun to discover a write who is consistently fun. Also, quick summer romances are always a win for me! I randomly won a signed copy of The Disenchantments last year and that's the reason why I haven't read it--I just stare at all my signed books and don't read them:) But now that you mention the boring beginning of the book, I think I HAVE tried it before from the library. WHY ARE THERE SO MANY BOOKS?! What is your favorite Kristan Higgins? I liked that The Disenchantments was about self-growth too! I couldn't connect with any of the characters but LaCour definitely wrote them well because I did understand the helplessness you described. Great review! I notice you read lots of books about self-growth and exploring teenage life etc Keertana, but The Disenchantments does sound quite interesting. They aren't my usual type of book to read honestly, but it does sound interesting. You also made me smile when you talked about laywers and abs. I'm sure some of them maybe work out at the gym. However I do know the feeling about repetition of a gorgeous man with abs grating on ones nerves after it is said over and over again. I do love novels that really get it right in their examination of high school graduate characters with their entire overwhelming lives spread before them. That's too bad, though, that the first part of this book was such a drag to get through! I guess this can be seen as an example of my greatest fear with DNFing, why I never do it: that the book will get suddenly, dramatically better. I'm glad you stuck around long enough for that to happen for you, Keertana! That is pretty neat that a single mother by choice was written as the protagonist of this story - it's always a good thing to recognize the diversity of life choices people make. But other than that, this doesn't sound particularly memorable, even in your review. Perhaps this shouldn't be my entry to HIggans' works.